Modern bungalow for rent in a luxury complex "Oasis Beach" with style "High Tech" in La Zenia. It is spread out over 73 m2 and consists of two bedrooms, lounge, kitchen, two bathrooms, utility room and terrace. It is complete with comfortable modern furniture (including a summer garden furniture), household appliances, bedding and towels, kitchen utensils, air conditioning in the living room. Russian TV is also available. The complex has a large inner green area with a playground and a communal swimming pool for adults and children. There is a private parking place. 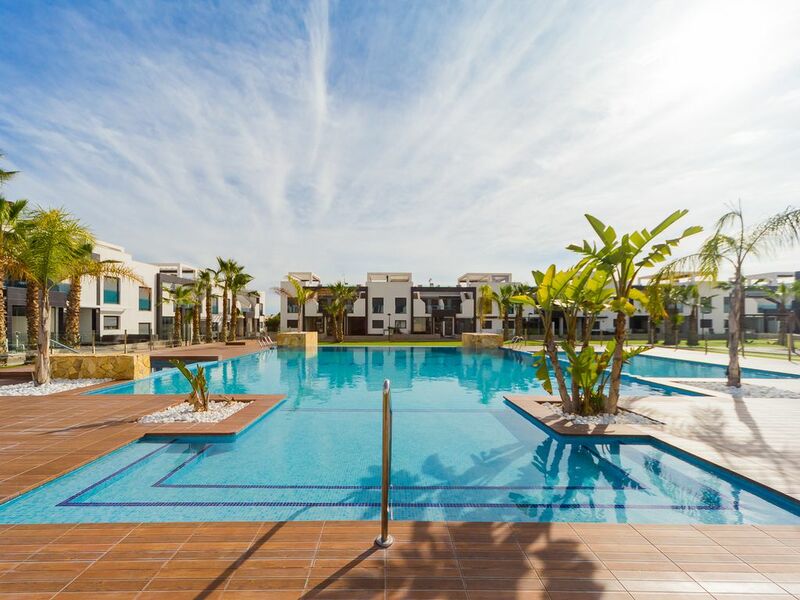 It is walking distance of a huge shopping complex of the Zenia Boulevard, where there are over 150 shops, including supermarket, bars, international restaurants, Casino, Cinema, Bowling and much more. It is 1 kilometre the blue flag beach of La Zenia. It can sleep up to six people. No pets are allowed and smoking is only allowed on the terrace.